SAR invites member institutions to welcome threatened scholars temporarily to campus as professors, researchers, lecturers, visiting scholars, post-docs, graduate fellows or students. 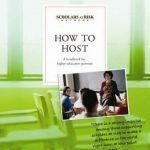 SAR’s How to Host handbook provides details about the hosting process, best practices and other helpful resources. Scholar candidates are nominated to SAR by member institutions or partners, or apply directly. Materials for qualifying candidates are circulated to Network members via private mailing lists, and members are encouraged to contact SAR for additional information, review this information, and consider hosting a visitor whenever a suitable candidate is identified. Network members always retain final selection authority over whether to invite any candidate and over which candidates to consider. Network members are also encouraged to identify candidates themselves through their faculty and other links by nominating cases to SAR. Each visit is arranged on a case-by-case basis, with the exact terms of the visit adjusted according to the needs and abilities of the scholar and of the inviting institution. Visits range from 3 months to 2 years, with the average visit lasting for one academic year (9-12 months). During the visits, scholars may teach, research, lecture or study depending on the needs of the host institution and the terms established for the visit. SAR asks host institutions, wherever possible, to identify funding to support the visit. Funding sources include central administration, departments, teaching funds, scholarships, private donors, community groups and foundations. SAR will assist interested hosts in identifying potential funding sources.